How Do I Know My Horse Has Colic? Colic is a symptom, not a disease in itself. Depending on what is causing the colic your horse may exhibit any one or a combination of the following symptoms. Pawing can be a colic symptom. Some horses paw when impatient or irritated, but if the behavior is unusual it could be a colic symptom. This symptom is more likely to be accompanied by other symptoms that indicate the horse is experiencing some discomfort. Biting at flanks. Horses may nip at their own flanks if they are biting at flies, but if there are no irritating bugs around, watch for other colic symptoms. Restlessness/Pacing--some horses pace when impatient, but if the behavior has no other cause it could be a colic symptom. A horse may alternately stand uncomfortably and then shift around in an effort to relieve their distress. Apathy is when your horse stands quietly and shows no interest in what is going on around it. Sweating can be an indication of distress or in some cases, fever. Standing stretched. If your horse is standing with its forelegs out and hind legs stretched behind it, it may be trying to relieve pain in its gut. Kicking at its abdomen, especially if there are no flies around. Substantially less or no manure is produced. Your horse should be making about eight piles of manure a day. If there is no manure, this could be an indication of impaction colic. Reduced or non-existent gut sounds. Horses' guts are noisy places, with lots of fermentation going on. Lack of noise may mean things have slowed down or stopped. Your horse’s intestines should make roiling noises easily heard with a stethoscope, or even with an ear against its barrel. Rolling is a classic sign of colic. If a horse is rolling to scratch itself, it will roll and perhaps rub its neck and head back and forth to give itself a vigorous massage. 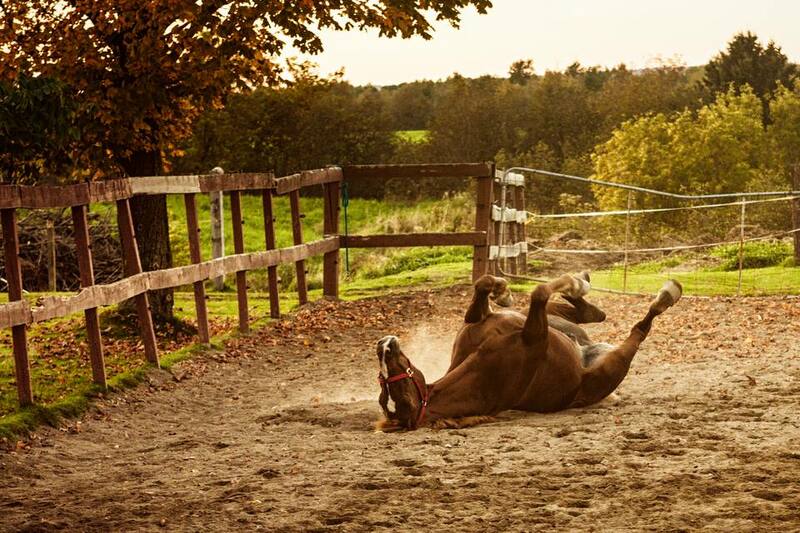 A horse with colic may get up and stand uncomfortably and then will often get down to roll again. If the horse is in extreme pain, the rolling may be violent and can make handling the horse difficult. Familiarize yourself with your horse's or pony's healthy vital signs and learn how to take your horse's pulse, temperature, and respiration before problems begin. That way you will have a good idea of what is normal. If your horse has any of the above symptoms and also has any one of the following it could be an indication of colic. Elevated pulse-the average is 27 and 43 beats per minute. Elevated temperature-the average is 98 F to 100 F.
Elevated or depressed respiration-the average is 8 to 16 times per minute. Remember that colic is a symptom, not necessarily an illness in itself. Many different diseases and problems can cause colic. An impaction, infection, spasm, excess gas, an obstruction, change of food, change of environment, change of schedule or many other factors can cause a horse to colic. A mild colic may pass quickly. But if the colic doesn’t resolve itself within a short time, call your veterinarian.